Reminder Rosie is designed to solve the very real daily challenges of memory loss. Inspired by the creator's father who suffered from dementia, Rosie is a personalized, voice controlled reminder system that older adults love! The clock plugs into the wall outlet for power, but battery backup (3 AAA batteries not included) retains the clock time and alarm settings even during a power outage. 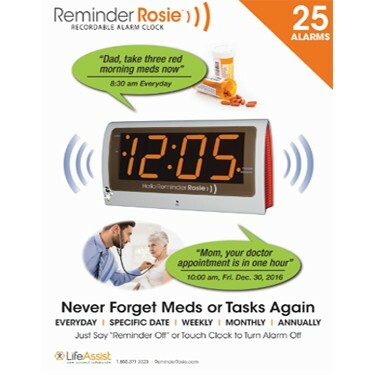 Rosie provides a simple, 100% hands free solution that helps you remember your medication, appointments, bill payments, tasks, etc. - without touching any buttons! The familiar-looking LED clock records personalized voice reminders that announce at ANY Time, in ANY language. Loud alarm and large display. So simple to use for the elderly, they actually enjoy her! With Rosie, you can record up to 25 reminders for everyday, weekly or ANY date. Review the day's reminders with a simple voice command so you stay in control. Exceptionally easy to use! Many devices require fiddling with buttons and switches to operate. With Reminder Rosie, you just start talking and Reminder Rosie is ready! This supplier accepts return of new, unused items in their original, sealed internal packaging, in re-saleable condition. No returns will be accepted after 30 days from purchase date.